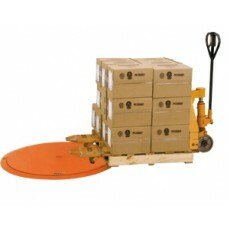 Presto Lifts LPT Pallet Turntable sits on the floor and has a tapered edge to allow hand pallet trucks to roll up onto it and place or remove a pallet. 7/8" high allows for pallet jack loading. Outer ring notch allows for lifting turntable off the floor for easy relocation. No lagging required. ♦  Turntable diameter: 43-5/8" diameter. ♦  Shipping Weight: 250 pounds. No lagging is required so the LPT can be moved to different locations. Presto Lifts LPT Pallet Turntable added to your Quote list!